Part 1: It is really, REALLY bad for your health. The below article popped up in an fellow vegan’s FB feed today. I thought it was so brilliant, I had to share. However, first up are just my thoughts about the situation before the actual article below. Can you tell I’m angry? Doctor McDougall is a nutritionist and physician who teaches better health through vegetarian cuisine. He’s been at the forefront of this field for the past 35 years. He runs retreats, classes and even holidays where he takes people with extreme diabetes, obesity, blood pressure and helps them make changes in their diet to cure their illnesses and the results speak for themselves. Even US insurance companies are starting to contribute towards the cost of his retreats as his results are much more effective than surgery and the meaningless Heart Council dietary recommendations which have been proven to be ineffective. What I am trying to say is that we really should listen to what this guy has to say. We need to listen, ask yourself if it could be true, do more research, check his footnotes, ask questions and if you think he is right, then make some changes to your diet and that of your loved ones. You don’t need milk, indeed, it has negative health impacts and you CAN survive… no THRIVE without this stuff. If you *do*agree with what this guy says, then you should also be really angry, you have every right to be. Be angry with the government dietetic associations who tell us that we should all be drinking milk every day to help our bones stay strong, the people who think that it is too extreme to eat a diet of plants yet it is considered acceptable to routinely cut people’s chests open, take out veins from their legs and then place it in their chests. You should also be angry at the milk industry, who have been grossly misleading us for decades with their ‘Got Milk’ campaigns, generous donations towards nutritional resources in our schools, ensuring milk is part of our schools lunches because if they make our kids get a taste for this stuff, then they’ll be our customers for life. Let’s face it, these guys just want to sell us more milk. Their marketing dollars, their manipulation of government bodies and their lobbying powers are the reason why the second most common question I get asked is ‘Where do you get your calcium?’* (Hmmm… The same place that the cows do… The plants!) To know that these people bear a significant part of the responsibility for our current health crisis and that it is allowed to continue? Well, in my mind it beggars belief. I feel for our children who are given milk at school, and consume it in great quantities inside and outside the home. These products are provided by our children’s caregivers who have the very best of intentions based on the messages they have heard all their lives. Sadly, it is our children who will continue to suffer ill-health and premature death needlessly by the million.I don’t know about you, but I think that is really sad. Here is Dr MacDougall’s newsletter and here is the original source. Nutritionally speaking, dairy foods are essentially “liquid meats”—but worse, because people drink milk, and eat cheese, guiltlessly—often thinking “milk makes my bones unbreakable, helps me lose weight, and makes my skin as soft and beautiful as a baby’s tush.” In their haste to sell products, the dairy industry has created an obsession over calcium that has become, in effect, a major contributor to the suffering and death of more than one billion people annually on Planet Earth from diseases of overnutrition—obesity, heart disease, stroke, arthritis, and diabetes. In the late 1970s when I was developing the McDougall Diet—after reading the bulk of the nutritional science published since the early 1900s—I came to the conclusion that starches, vegetables and fruits were ideal for human nutrition. I then asked myself, what would be gained and lost by adding other food categories (dairy, meats, poultry, fish, free-oils, sugars, etc.) to this elemental foundation? In the case of dairy foods, I quickly eliminated the “calcium advantage” because Nature packaged her foods so efficiently that developing a disease due to calcium deficiency is nearly impossible on a diet of plant foods (See last month’s newsletter—February 2007). After almost three years of exhaustive research I concluded: adding dairy foods to my original plant-food-based diet would only supply more calories, fat, animal protein, cholesterol, sodium, microbes, and chemical contamination—ingredients that were making most of my patients ill in the first place. In the final analysis, I found myself unable to discover any reasons to add dairy into the McDougall Diet—the hazards weighed heavily and any benefits were overstated, or blatantly falsified. Yet the drone from the dairy industry’s propaganda continues three decades later. I am the uncommon voice out there in the wilderness; people tired of listening without questioning will find my analysis of some of the dairy industry’s most familiar messages refreshing. The National Dairy Council refers to their products as “Nutritious and Delicious.” Undoubtedly, consumers love ice cream, cheese, yogurt, and butter. But the reason is, they are loaded with sugar and salt; otherwise no one would eat them. The National Dairy Council knows the importance of adding sugar and other flavorings, reporting, “Studies show that elementary school kids drink 28 percent more milk when offered in “cool” flavors and packages.”1 When I was a child, my school required all students to drink milk daily. A small carton of white milk was 2 cents and chocolate was 3 cents. I always splurged, because I gagged from the taste of white milk. The reason plain milk is at all palatable is because it naturally contains about 30% of its calories as sugar (lactose). Chocolate, strawberry, and other flavored milks contain additional sugar. The more sugar, the greater the attraction to dairy; witness ice cream with 52% of the calories as sugar. My patients taught me how really disgusting basic dairy foods taste. During my residence training in the mid-1970s, I cared for people with kidney failure, who were required to be on very salt-restricted diets. One of my duties was to recommend they eat salt-less butter and salt-less cheese. Their response was, “Doc, I can’t eat a glob of greasy lard.” Without the salt, these yellow blocks of fat are unpalatable. Adding salt and/or sugar to enhance the taste of potatoes, beans, rice, vegetables and fruits would be a much healthier and tastier choice, rather than mixing it with all that fat found in dairy products. The National Dairy Council writes, “A large body of scientific research collected in recent decades demonstrates that an adequate intake of nutrients (e.g., calcium) from dairy foods such as milk, cheese, or yogurt positively affects bone health by increasing bone acquisition during growth, slowing age-related bone loss, and reducing osteoporotic fragility fractures.”2 The truth is dairy products can have bone-growth-stimulating effects. Dairy foods increase growth hormones: In addition to calories and nutrients to support growth, cow’s milk increases hormones that directly stimulate the growth of the calf. The most powerful of these hormones is called insulin-like growth factor-1 (IGF-1). When cow’s milk is fed to people, IGF-1 levels also increase. Studies funded by the dairy industry show a 10% increase in IGF-1 levels in adolescent girls from one pint daily and the same 10% increase for postmenopausal women from 3 servings per day of nonfat milk or 1% milk.4,5This rise in IGF-1 level is an important reason for the “bone-building” effects of cow’s milk. Dairy Foods Raise Estrogen: The message that estrogen builds fracture-resistant bones (prevents osteoporosis) has been hammered into women’s minds over the past 4 decades by the pharmaceutical industry, selling HRT formulas, such as Premarin and Prempro. Food also raises estrogen levels in a person’s body—and dairy foods account for about 60 to 70% of the estrogen that comes from food.8 The main source of this estrogen is the modern factory farming practice of continuously milking cows throughout pregnancy.8,9 As gestation progresses the estrogen content of milk increases from 15 pg/ml to 1000 pg/ml. Well-recognized consequences of excess estrogen are cancers of the breast, uterus, and prostate. 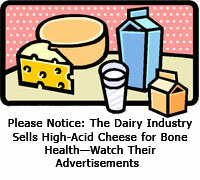 Thus, dairy products have bone-building effects—IGF-1 and estrogen; and bone-destroying effects—dietary acid and protein. The net result depends upon the final balance of these accumulative effects. (Note that calcium consumed results in little of either a positive or a negative change for the health of the bones. See the February 2007 McDougall Newsletter for details). A common practice of researchers designing studies to show dairy is beneficial to bone health is to first neutralize the dietary acids with lots of fruits and vegetables or add antacids (like Citracal) to the experiment.12 By this means, the positive effects, like bone growth stimulation from IGF-1, will dominate. 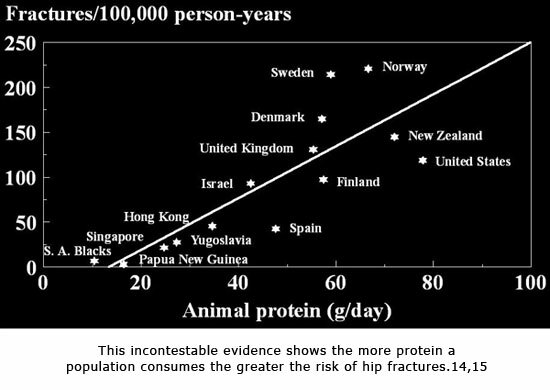 Consistently, when populations of people who eat different diets are compared, rates of hip fractures increase with increasing animal protein consumption (including dairy products). For example, people from the USA, Canada, Norway, Sweden, Australia, and New Zealand have the highest rates of osteoporosis.14,15 The lowest rates are among people who eat the fewest animal-derived foods (these people are also on lower calcium diets)—like the people from rural Asia and rural Africa. 14,15 Dietary protein correlates directly with the dietary acids consumed. The dairy industry promotes dairy consumption for weight loss, even though they know their campaign is false. Consider the conclusion of a review article they funded that was published in a 2003 issue of theJournal of Nutrition, “Nine studies of dairy product supplementation were located: In seven, no significant differences in the change in body weight or composition were detected between treatment and control groups. However, two studies conducted in older adults observed significantly greater weight gain in the dairy product groups.”17 At the Dairy Product Components and Weight Regulation Symposium held on April 21, 2002 in New Orleans, LA. Dr. Susan Barr (who frequently works for the dairy industry), said “In conclusion, the data available from randomized trials of dairy product or calcium supplementation provide little support for an effect in reducing body weight or fat mass.”17 See, they know the truth, but fail to share it with the customers. Research published since this review has been supported largely by the dairy industry and fabricated to support their profitable weight loss campaign. The National Dairy Council says, “Minorities who have experienced gastrointestinal problems consuming milk are learning new strategies to enjoy milk and other dairy foods. This means that minorities (and non-minorities) with lactose intolerance no longer need to miss out on essential nutrients provided by dairy foods. The health consequences of avoiding dairy foods, the major source of dietary calcium, may be especially serious for African Americans, Hispanics, Asians, and Native American Indians. Many minorities are at high risk of hypertension, stroke, colon cancer, and osteoporosis – diseases in which a low calcium intake can be a contributing factor.”18 This is fear-mongering at its worst. White people have a high tolerance for the sugar found in milk, known as lactose. Non-whites commonly have a normal, natural “intolerance” to milk sugars, and such sugars consumed after the weaning-time cause them intestinal distress with flatulence, cramps and diarrhea. Milk makes 60 to 90 percent of these people sick. Because of their financial power and political connections, the people in the dairy industry can say whatever they want and no one can stop them. Questioning consumers, however, might ask themselves, “Why are humans the only animals that drink milk of another species, and continue to drink it after normal weaning-time?” And “Why would Nature (or our Creator) design us so that in order to get a necessary nutrient, calcium, we must risk our lives? With a $206.5 million annual budget dedicated to confusing people and covering up the truth for the sake of profits, and with the current political climate, there is no hope of regulating the dairy industry—or more appropriately for such a hazardous substance, outlawing these cow products for human consumption.21Fortunately, thinking people are freeing themselves and their families from sickness and obesity by learning that human nutritional needs are far removed from those of baby cows. 3) J Pennington. Bowes & Church’s Food Values of Portions Commonly Used. 17th Ed. Lippincott. Philadelphia- New York. 1998. 4 Cadogan J, Eastell R, Jones N, Barker ME. Milk intake and bone mineral acquisition in adolescent girls: randomised, controlled intervention trial. BMJ. 1997 Nov 15;315(7118):1255-60. 5) Heaney RP, McCarron DA, Dawson-Hughes B, Oparil S, Berga SL, Stern JS, Barr SI, Rosen CJ. Dietary changes favorably affect bone remodeling in older adults. J Am Diet Assoc. 1999 Oct;99(10):1228-33. 6) Moschos SJ, Mantzoros CS. The role of the IGF system in cancer: from basic to clinical studies and clinical applications. Oncology. 2002;63(4):317-32. 7) Rincon M, Rudin E, Barzilai N. The insulin/IGF-1 signaling in mammals and its relevance to human longevity.Exp Gerontol. 2005 Nov;40(11):873-7. 8) Sharpe R. Are oestrogens involved in falling sperm counts and disorders of the male reproductive tract?Lancet 341:1392, 1993. 9) Janowski T. Mammary secretion of oestrogens in the cow. Domest Anim Endocrinol. 2002 Jul;23(1-2):125-37. 12) New SA. Calcium, protein, and fruit and vegetables as dietary determinants of bone health. Am J Clin Nutr. 2003 May;77(5):1340-1. 13) ) Remer T. Potential renal acid load of foods and its influence on urine pH. J Am Diet Assoc. 1995 Jul;95(7):791-7. 14) Abelow B. Cross-cultural association between dietary animal protein and hip fracture: a hypothesis. Calcific Tissue Int 50:14-8, 1992. 15) Frassetto LA . Worldwide incidence of hip fracture in elderly women: relation to consumption of animal and vegetable foods. J Gerontol A Biol Sci Med Sci. 2000 Oct;55(10):M585-92. 17) Barr SI. Increased dairy product or calcium intake: is body weight or composition affected in humans? J Nutr. 2003 Jan;133(1):245S-248S. 19) Lanou AJ. Bone health in children. BMJ. 2006 Oct 14;333(7572):763-4. 20) Griffith LE, Guyatt GH, Cook RJ, Bucher HC, Cook DJ. The influence of dietary and nondietary calcium supplementation on blood pressure: an updated metaanalysis of randomized controlled trials. Am J Hypertens.1999 Jan;12(1 Pt 1):84-92. An excellent podcast explaining where calcium REALLY comes from. Milk… Is the Cruelty Justifiable? I love this video aimed at teens.